This wikiHow article on how to open a difficult jar has really made my life easier! My new jar opening method of choice is the Butter Knife Method. WikiHow is such an awesome resource! I have the Wikihow of the Day on my iGoogle homepage. Love it! 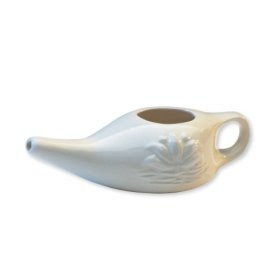 I'd like to endorse a product that has become more like a member of the family -- the Neti Pot. I use the butter method too, but I was applying the knife in the wrong way! LOL I was striking the lid at an angle with the knife in a complete circle ...lots of noise too! I'm gonna try to new way the next time! Use the tip of a butter knife and wedge it between the lid and the jar. Continue to apply force like a lever, moving the knife all the way around the lid. i just use the butter knife in one or two places (like a lever) until i hear the seal pop and then it opens easily. oooooh....the neti pot! it scares me a little! funy that you are a neti pot multi-tasker!!! hope you ate having a great week!